Paua nuggets are made from cut and tumbled paua shell. 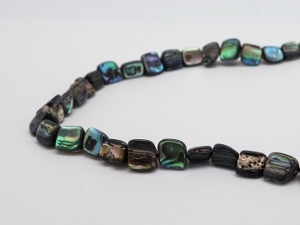 Paua is the species of abalone shell (Haliotis iris) found only in the cold waters of southern New Zealand. The coloring varies from shell to shell and has an amazing iridescence. The lighting in the photo above does not do justice to the array of colors found in these nuggets. There are 48 nuggets per strand. 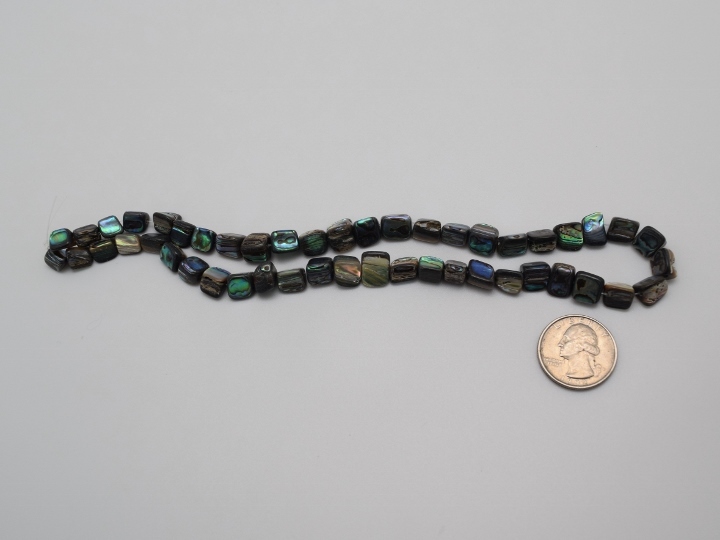 The strands are 8 1/4" long (21 cm) and the beads are at least 1/4" long (0.6 cm). The average cost is US$0.78 per nugget. Genus and species: Haliotis iris. The government of New Zealand strictly controls the harvesting of abalone for food. The shells are a natural by-product of the food industry.